NOTE: As mentioned in a recent post, the comments function of my blog no longer works. I tried to get the problem sorted out before going on the road, but to no avail. I finally resorted to setting up a new blog at another URL. It contains all of the posts that reside at this URL, but also has all of the missing comments and allows new comments to be posted. You can find the version of this post which you can post comments to here. I’ll try to remember to put up new posts here, but I suggest updating your bookmark to the new URL. — Additional Note: I am just catching up on putting these posts onto this secondary blog. They have existed at the new blog URL for a few weeks. For those who are concerned that we may yet be on the road dealing with the much colder weather that has moved into the southwest, the good news is that Sabrina, Sage and I rolled into Bisbee late last week. Now I’m busy getting us settled in at the house where we will spend our third winter since my decision to leave the farm following Don’s death. This autumn’s journey proved to be very different than those of the past two years. I look forward to sharing photos and accounts of this trip. My plan to post to this blog while traveling turned out to be a bust as I was not able to set up a 3G account for the iPad once in the states. Due to the remoteness of my route, I had very few chances to make use of wifi hotspots, so I’ll have some catching up to do over the next couple or so weeks. Watch for more frequent posts now that I have a good net connection for the winter. Before I get to the subject of this post, I would like to say a few words about the overall journey. Until arriving at Writing-on-Stone in southeast Alberta, I had no real feel for the direction that we would take over the next month. Originally, I had been planning to do a less meandering version of the route we had followed over the past two autumns – down through Washington and Oregon, along the coast of northern California, over to the east side of the Sierras, across the Mojave into northwest Arizona, and then a diagonal to our destination in the southeast corner. However, while camped at WOS, I came to the realization that I wasn’t feeling up to that route. I think it was less a case of mileage, and more that I wanted to spend time in wilder places where I could be alone much of the time. In the end, I decided to drive south through Montana and Idaho, then wander through Utah for a few weeks. The arrival of colder weather by the time I reached Idaho caused me to delay a couple of days holed up in a motel, and then push on down to the most southern part of Utah, abandoning part of my plan to revisit and spend more time around the Escalante and Capitol Reef region. At some point, the journey took on a very different feel as I found myself reluctant to come into even the smaller towns, and instead, seeking out quieter places to camp. Also, what began as a casual interest in visiting a couple of petroglyph and pictograph sites, and also pueblo ruins, shifted to become what might be considered a major thread in this autumn’s journey. Over the next few posts, I will try to write about some of these special places. After leaving Idaho, I drove south on I-15 with the intention of camping at a favorite site outside of Kanab. However, after a morning of driving, I began to feel some fatigue. I should mention that this has happened more often on this trip than in the past. The only explanation I can come up with is that I don’t seem to be experiencing the same angry, smoldering fire that has kept me pushing onwards over the past two years. In its place, there exists a more mellow state of mind that seems prone to fatigue. In any case, at a rest stop, I studied my map and noticed that it wasn’t much further to the turn-off for I-70 which passes Fremont Indian State Park. I had thought of visiting the park on my way through last April, but the weather was frigid and it had been snowing that day. However, on this day, just the peaks of the mountains were dusted with fresh snow, so I decided to take that route, reasoning that if it was too cold to camp, I would just push on to some other place at a lower elevation. Arriving at the park, I found that it was cool but sunny. 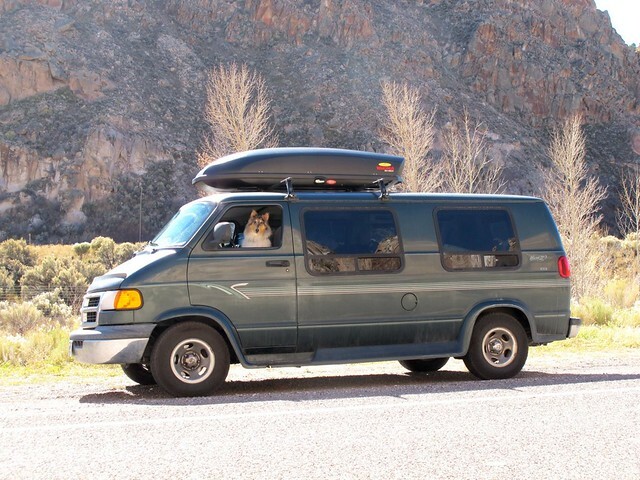 I checked out the Castle Rock Campground before going on to the visitor center and museum. The water was shut off for the season, so the campsite rate was reduced – always good for my budget. 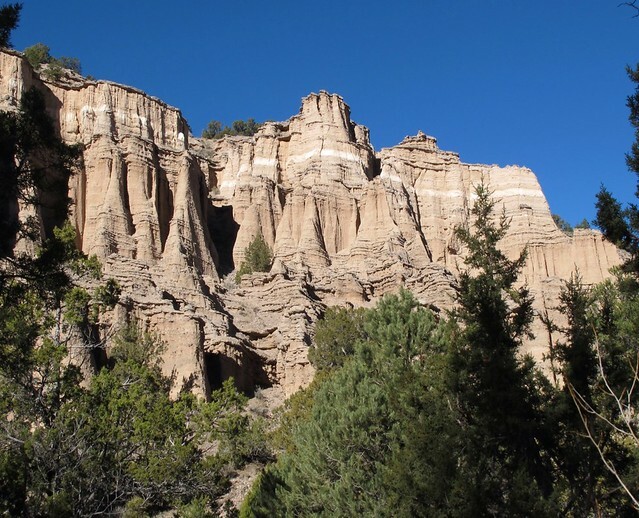 There were no other campers, which was much to my liking, as were the towering stone spires, and the tall cottonwoods shading a trickling creek with their glowing yellow leaves. Camping beneath autumn-leaved cottonwoods became a signature for this season’s trip as I moved ever southward following warmer weather. I chose a site which would receive the earliest morning light as these deep canyons often remain shaded until almost noon. With our evening accommodations sorted out, I drove to the museum and visitor center on the other side of I-70. It was very quiet there as well. 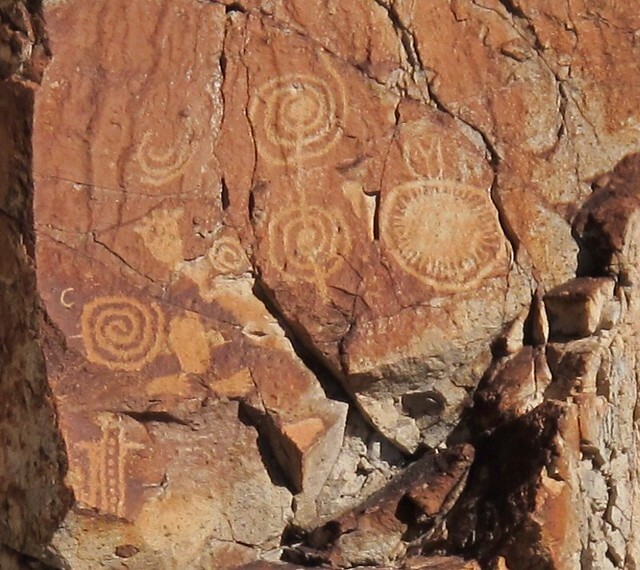 Park staff directed me to a couple of short trails from which to view petroglyphs – of which there are many. Before leaving the center, I purchased a copy of Archaeology of Clear Creek Canyon (Janetski), which tells of the study of this canyon during the 1980s, before construction of I-70 which would forever destroy several ancient village sites. 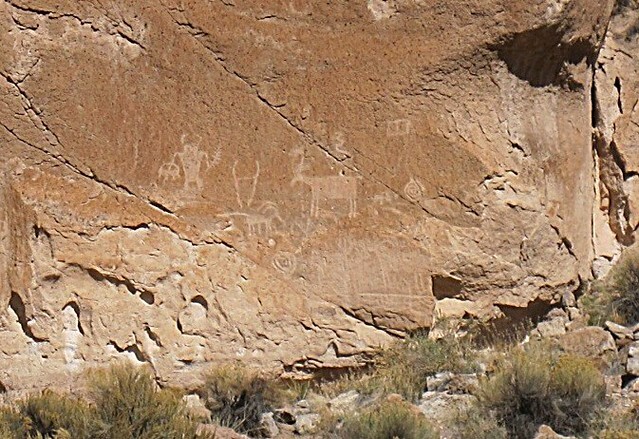 Fremont Indian State Park was established in 1987 to preserve the almost countless panels of petroglyphs found throughout a fairly concentrated area. The museum houses thousands of artifacts unearthed during the excavations that took place before the building of I-70. A few bits of information from the above-mentioned book. 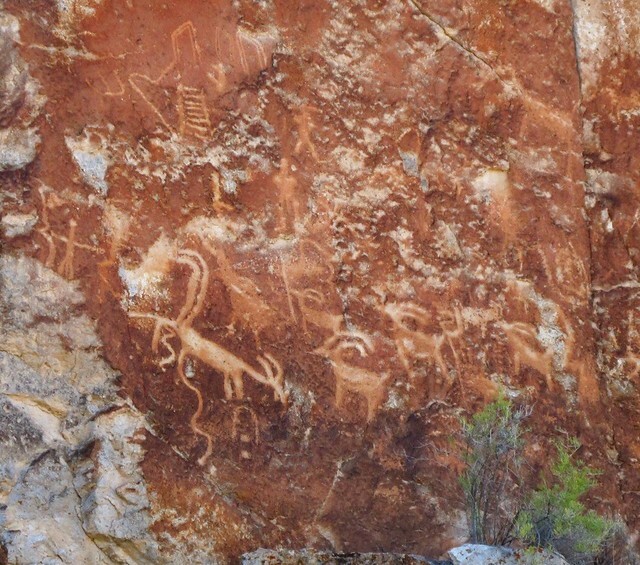 Petroglyphs in the park are believed to date back at least 1,800 years.t They are of several styles representing successive cultures that may have lived in the region. 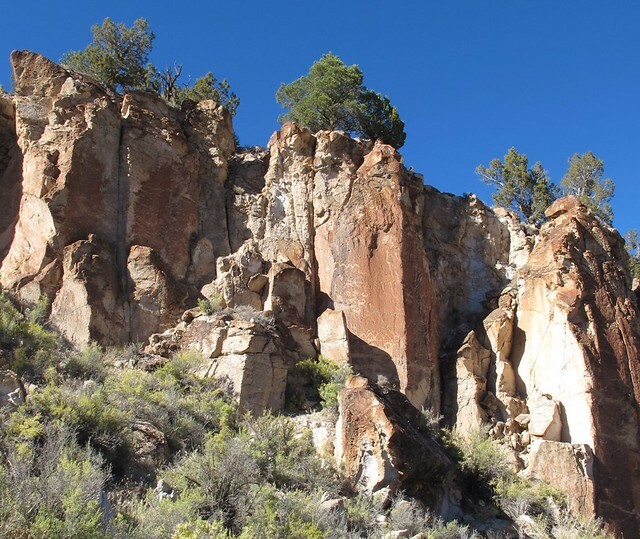 At the time of publication of the book, there were 43 recorded sites containing 697 panels and over 3000 elements within a study area of about 5 linear miles following Clear Creek Canyon. Many of the panels exhibit evidence of superpositioning – the addition of more recent elements over older elements. While visiting the museum, I purchased a second book entitled Rock Art Savvy: The Responsible Visitor’s Guide to Public Sites of the Southwest (Sanders). Back at camp, I flipped through it and soon realized that the route which I had been sketching out for the Utah leg of our journey, would take us to the doorstep of a good many of the sites. I began figuring in small side trips in search of rock art and ruins. The dogs and I enjoyed an evening walk followed by a quiet night. 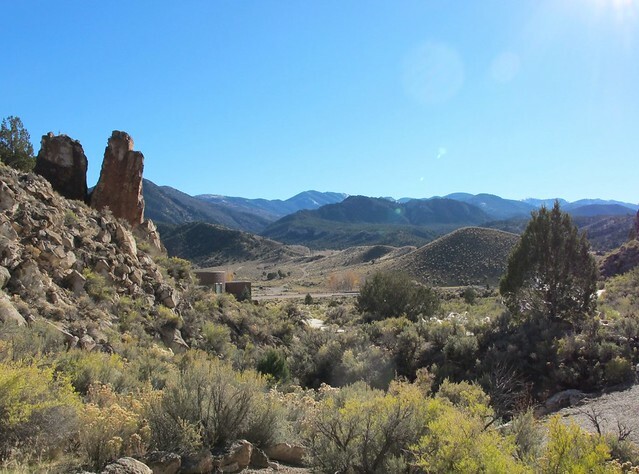 At other times of the year, the campground would undoubtedly be full and busy as there is an extensive network of ATV trails passing through the park – part of a much larger system that extends throughout much of southwest Utah. However, for those who are willing to brave the cooler temperatures of autumn, it’s likely that they would find the park quite peaceful. In the morning, I cooked up pancakes for the three of us before setting out for Kanab. Upon leaving, I stopped along Rte 4 for a last look at several panels of petroglyphs. As always, when in the presence of such creations, I feel fortunate to be able to visit these places to gaze upon images that continue to speak to us across centuries.